Earlier this week I was pleased to learn that Joel Fingard, the Executive Director of the Manitoba Combative Sports Commission,is among the readers of this blog. I am curious if you have given any thought on how the new s-209 will affect other sports such as fighting in the NHL. With an updated law that is more clear in regards to amateur and professional prize fighting do you anticipate this being applied to NHL or any other professional sports that have a certain amount of fighting in it? The key provision being the “previous arrangement made by or for them”. Unless it is expressly agreed that a fight is going to take place at an event ahead of time I don’t see this provision being applicable. The authorities seem to reserve criminal prosecutions for NHL events for severe incidents such as the Brashear/McSorely affair. I don’t expect there to be any prosecutions for run of the mill hockey fights following this bill’s passing. After this exchange, I looked into Parliament of Canada’s Hansard transcripts which is one of the best sources to reference when seeking insight into the intent of a law. Among the various useful discussions were several comments which strengthen the view that Parliament has no intent in having Bill S-209 extend to incidental fights in non-combat sports. People are likely wondering why this bill adds only feet to the current definition of a prize fight. The reason is simple: there are no combat sports that do not use fists, hands or feet in some way, but there are sports, such as football and hockey, where contact is permitted with other parts of the body. By adding more descriptors, we would simply be adding more problems. That is why the proposed definition mentions only fists, hands and feet. 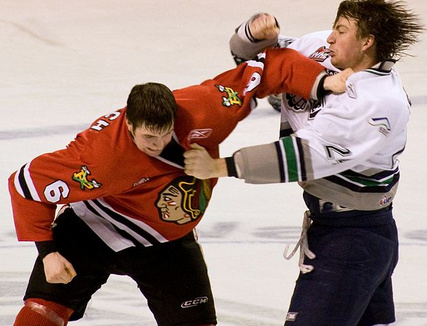 In ice hockey, fighting is occurred very frequently. But it is very bad sign. In every match a team will be won and other will be lost. So every player should be prepared to take it easy. If they should not then it is occurred. Hope they will take it easy. It is also harmful for their reputation.